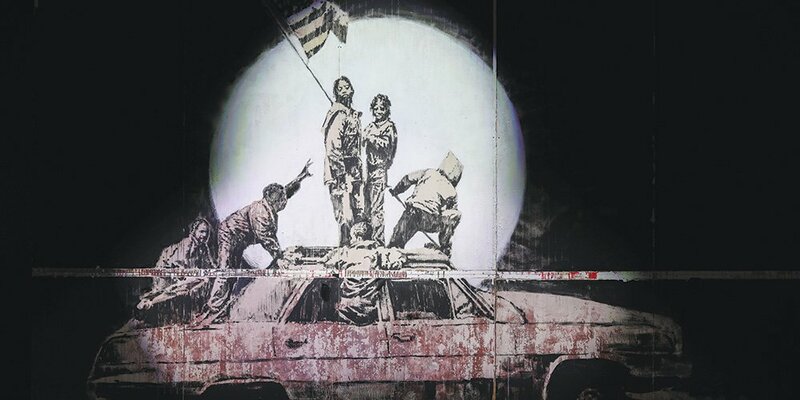 The Art of Banksy, a multi-media exhibition at Magic City Studios through Feb. 28, shares prime examples of the famed artist’s socially conscious commentary. Banksy is all things anti: anti-capitalist, anti-war, anti-imperialist, anti-establishment, anti-authoritarian, anti-politics, anti-propaganda, anti-elitist, anti-art world community. His satirical pieces express his great activism, great criticism and great disdain. The cult-like following surrounding the underground artist is understandable, and the simplicity of his cheeky art certainly does not undermine its power. If anything, it makes it larger, louder, legendary. Most recently, his famous Girl with Balloon sold for $1.4 million. As soon as the auctioneer’s hammer slammed down, the artwork self-destructed and dramatically shredded. Banksy claimed responsibility, and named the altered piece Love Is In The Bin. Such is his dark humor. And, “Banksy-ed” is now a term. For the reclusive and infamous talent, a leading voice of dissent, the whole world is his canvas. His imagery has lined the streets of Ontario, Paris, Manhattan, Bristol, Mali, Jerusalem, San Francisco, Melbourne, Birmingham, London, New Orleans, and Los Angeles among other cities. While many lucky pedestrians have seen Banksy’s keen guerilla art in the wild, this might be the closest you’ll come to seeing his iconic objets d'art in Miami. But Banksy’s universe goes beyond the stencil and spray paint street art aesthetic. The pseudonymous thought-provoker has authored a handful of books, including the best-seller Wall and Piece, and directed the documentary Exit Through the Gift Shop which debuted at Sundance and received an Oscar nomination. He’s painted cows (actual cows), opened a hotel in Bethlehem, mounted his controversial work in NYC museums, illustrated cover art for several music albums, showcased a pink-painted elephant at his art exhibit as “the elephant in the room,” designed a traveling waterfall in the back of a delivery truck, and even created an opening sequence for The Simpsons show. It’s also important to note that Banksy has been creating and selling art to private collectors since the 1990s. The Art of Banksy consists of some of these. And, he set up the company, Pest Control in 2009 to authenticate and sell his pieces. Other street artists (and their estates) have also sold originals - from Keith Haring and Jean-Michel Basquiat to Shepard Fairey and Mr. Brainwash. The Art of Banksy collection hit Berlin, Tel Aviv, Amsterdam and other cities before making its way here (first U.S. stop). While not authorized by Banksy, this 20,000 square-foot, maze-like space highlights some of his paintings, canvasses, screen-prints and sculptures. None of these pieces originally lived in the street. All the privately owned creations, described as the world’s largest collection of Banksy’s works, are rarely or never before seen. It’s an extraordinary body of work by the irreverent artist, complete with proper certificates of authenticity issued by Pest Control. Steve Lazarides, who carefully curated this experience, shares, “I’m proud that together with the collectors we have been able to assemble this collection now being presented in Miami.” As the enigmatic artist’s former agent, publicist, gallerist, photographer and collaborator from 1997-2008, Lazarides knows his genius firsthand. He documented Banksy’s work during their time together, and his photography archive accompanies the exhibit. “There is no reason why there shouldn’t be a Banksy hanging in every single major contemporary art museum in the world. He is the most powerful recognized artist of a generation that’s been completely ignored by the establishment thus far,” he added. 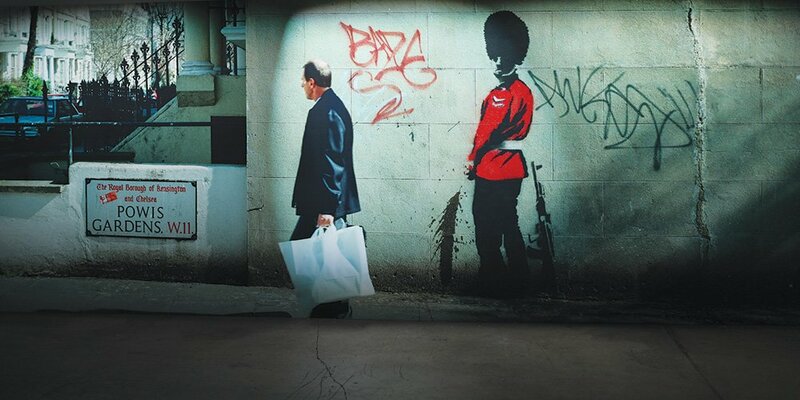 There is so much to take in, 80 of Banksy’s pieces to be exact! Opt for the contextual audio tour for behind-the-scenes details on how the works, made between 2000-2011, came about. You’ll gain much more insight on the elusive artist, and witness the evolution of his courageous art. · Girl with Balloon, just like the one that was shredded. This memorable piece was voted “best loved work of art” in the UK. · Rage, the Flower Thrower features a man dressed in riot gear throwing a bouquet of flowers instead of the expected Molotov cocktail. · Pulp Fiction is a humorous tribute to Quentin Tarantino’s movie. But, instead of guns, the actors are holding bananas. · Flag Wall depicts young Americans raising the American flag on top of a decaying car. · CCTV Angel is his anti-surveillance sculpture piece, a tall Winged Victory of Samothrace replica with a camera for a head. · Several screen-prints on paper, entitled Rude Copper, show a British police officer giving the middle finger. The Art of Banksy, along with Magic City Innovation District Foundation and local community organizations, gave free tickets to 50,000 local children. Open daily, the exhibit is located at 6301 NE 4th Avenue, Miami, FL 33138.